There are words I have waited years to hear, and a press release from Walt Disney World has just uttered them, “Disney's Fort Wilderness Resort and Campground Gets a Facelift!” The resort wide renovation will include work to campsites, cabins, pet facilities, and even the Meadow Swimmin’ Pool. Campsites can expect updates to picnic tables and grills. A new “Premium” campsite will be available for RVs. Citing the expanded length of RVs, RVs have gained twenty-seven feet on average since Fort Wilderness opened in 1971, as well as the awnings that most modern RVs have on their sides, these new Premium sites will have a larger concrete pad to accommodate these vehicles’ needs. Around the Meadow Swimmin’ Pool, a hot tub, child’s water play area, and a themed slide will be added. These additions are following the recent remodeling work which decreased the depth at the deep end of the pool. For those who want creature comfort without the creatures, the Wilderness Cabins have always offered a home away from home. During this update, the cabins will be receiving new furniture, linens, fixtures, carpeting, and paint. For the canine crowd, the article mentions the recently opened Waggin' Trails Dog Park. Waggin’ Trails is an off-leash playground built specifically for the active pup in your family. Fort Wilderness was the site of all of my family trips for a number of years, and I am glad to see the ‘grounds getting some much needed love. The fact that they are updating sites to coincide with the additions to RVs lets me know that there is a deep appreciate of Fort Wilderness, and it will be with us for many years into the future. I was already expecting to catch up with Fort Wilderness and relive some very fond memories when I am at Walt Disney World next month, but now I have even more reason to check in on my old stomping ground. I’ll have an update on how the work is progressing after my trip near the end of next month. And should you see this newspaperman wandering around, be sure to say hello. Spanish Moss Trail was my loop. I was a tent camper and on my 4 to 5 stays in Fort Wilderness I always seemed to wind up there. On one particular stormy night I slept under a picnic table; everything was soaked. The weather in central Florida can be unpredictable, that is for sure. I remember we once saw hail at Fort Wilderness in the middle of summer. 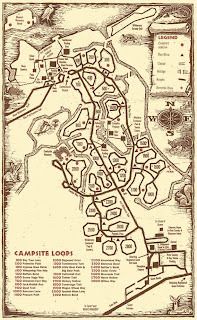 As for loops, we always stayed on the 800 loop, Jack-Rabbit Run. It may have beena preferred site, but it was our home away from home for many a years! I grew up at Fort Wilderness with my family as well!! We spent many a thanksgiving there and it certainly holds a special place in my heart.